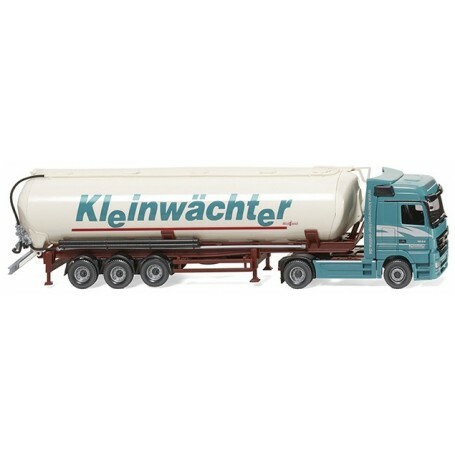  Silo trailer truck (MB Actros/Spitzer) "Kleinwächter"
Silo trailer truck (MB Actros/Spitzer) "Kleinwächter"
Silo trailer truck (MB Actros/Spitzer) 'Kleinwächter'. Tractor and driver's cab with high roof as well as wind deflectors and side spoilers in turquoise-blue. Side flatbeds with silver company logo www.kleinwaechter.biz. Interior with steering wheel black. Sun visor also black. Lower part of driver's cab with front fenders and underride guard on side turquoise-blue. Chassis with cardan shaft and exhaust in oxide red. Rear fenders black. Fifth wheel plate silver. Tail lights transparent red. Wheels in silver. Enclosed mirror set black. Headlights and Mercedes-Benz star painted silver. 'Actros' logo printed silver. Front of driver's cab with company name 'Kleinwächter' in silver. Window surrounds and windscreen wipers black. Model designation '1844' as well as stripes and 'Kleinwächter' lettering with phone number printed silver on the side. Tanker trailer as well as hydraulic cylinder, tread with ladder in white, rear fittings as well as bumper in silver. Chassis with stand and underride guard in oxide red. Toolbox in black. Wheels silver, turquoise-blue company logo 'Kleinwächter' on side with red underlining. Company logo 'Kleinwächter' also on rear in turquoise-blue.